Cobbler is one of those desserts that is tasty in the summer and (to me, at least) even better in the winter. Put some ice cream on it, and it is warm and cool all at the same time. Who doesn't like that warm, sweet, gooey deliciousness? Well, my friend Karra, for one. She makes it because her husband loves it and she loves him. Isn't that sweet, too? 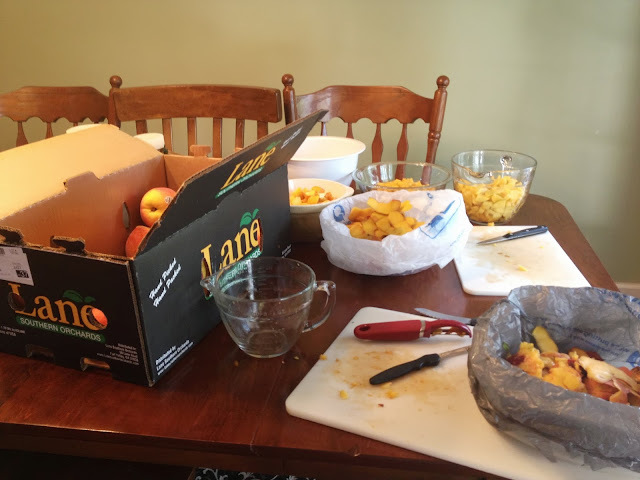 When Karra and I finished canning the peach jam last week and still had plenty of peaches left from our 50 lb. load, we decided to make something else rather than more jam. 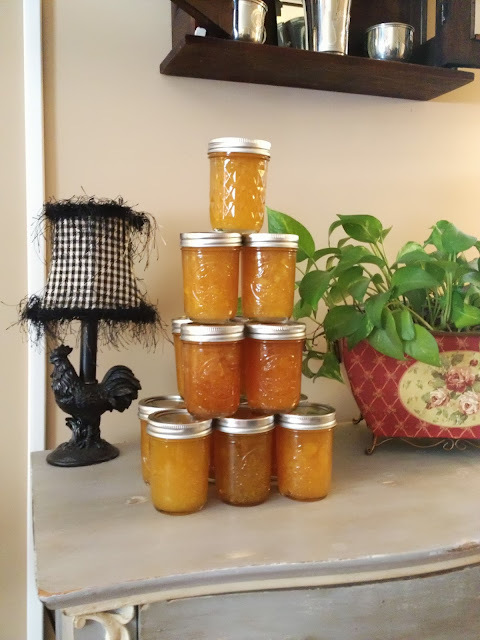 Karra had made "Apple Pie in a Jar" last fall, so why not make peach pie or cobbler in a jar? I did it. I really did it: I actually canned something. To be honest, my friend Karra helped me can something - peach jam and peach cobbler. My head didn't explode; the house did not burn down. It was really very painless and quite rewarding. Karra called me last week and said that "local" peaches (really from Georgia, not North Carolina where we live, as we were amused to discover) were on sale for $0.79 that day and asked if I would like to make peach jam with her. What I didn't know was that she was planning on buying 50 (that is five-oh) pounds of peaches. Yikes! Did she know they have to be peeled?? I jumped right in, though, so I could learn the mystical art of canning. Best thing I learned, however, is that it is not so mystical after all. It was really pretty easy and Karra has a great way of doing it with no canner needed. Would you believe it involves the dishwasher and beach towels? ?